It's so exciting to be back on the Butterfly Reflections Ink blog today. I've missed sharing with you guys! 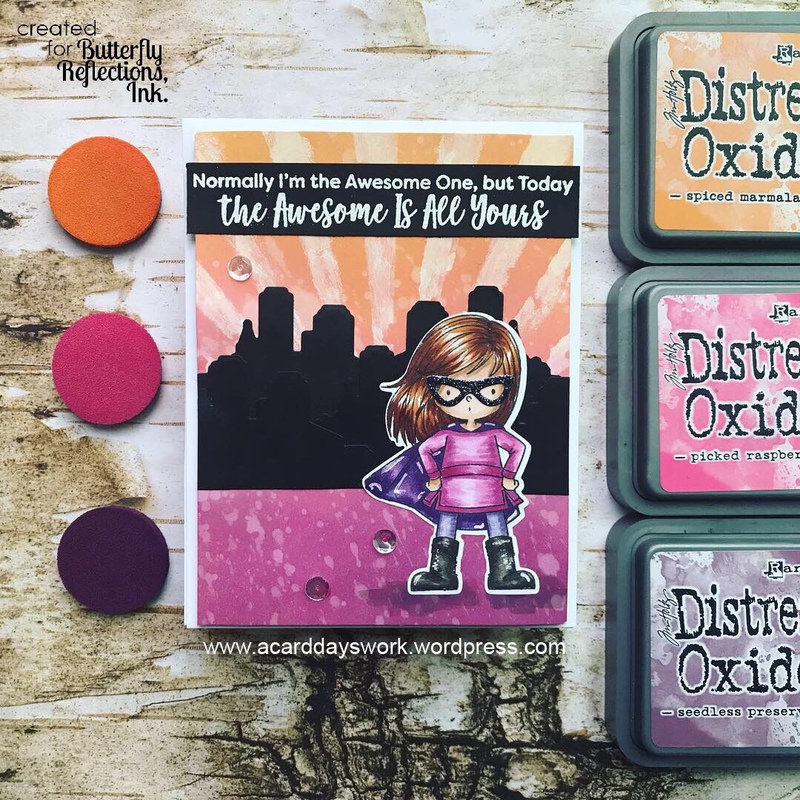 For today's project, I focused on My Favorite Things products for a super cute card. See what I did there? To get started, I did some ink blending with Distress Oxides. I used Spiced Marmalade, Picked Raspberry, and Seedless Preserves. I absolutely love this color combination. Once I finished my blending, I used some clean water and the Splatter Brush from Tim Holtz/Ranger to add specks of water all over my panel. I also grabbed some white paint and the Rays stencil from Tim Holtz to add some interest to the sky. I set this aside to dry. 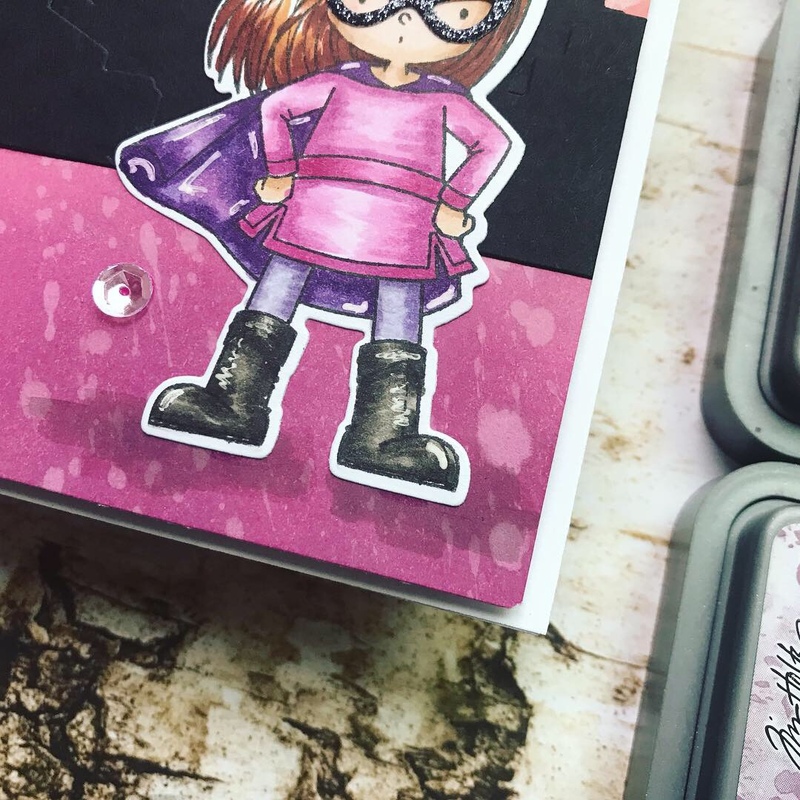 I decided this background was worthy of a super hero, so I grabbed the new (to me) You're Super set from MFT. I've had my eye on this set for AGES, so I'm thrilled to finally have the chance to use it. 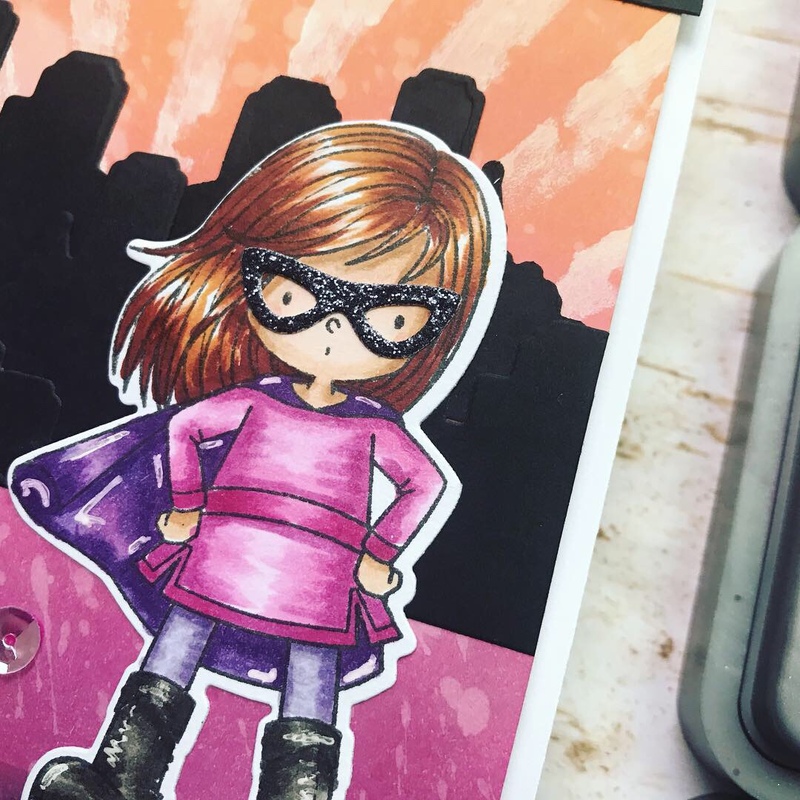 I stamped out the adorable super hero and colored her up using Copic markers. I die cut her mask from glitterstock and used the coordinating dies to cut her out as well. For the city skyline, I cut 5 of the cities from black cardstock using the coordinating die set. I love that you can use this with or without the stamped image. I layered them all in an overlapping pattern and then adhered them to my blended background. 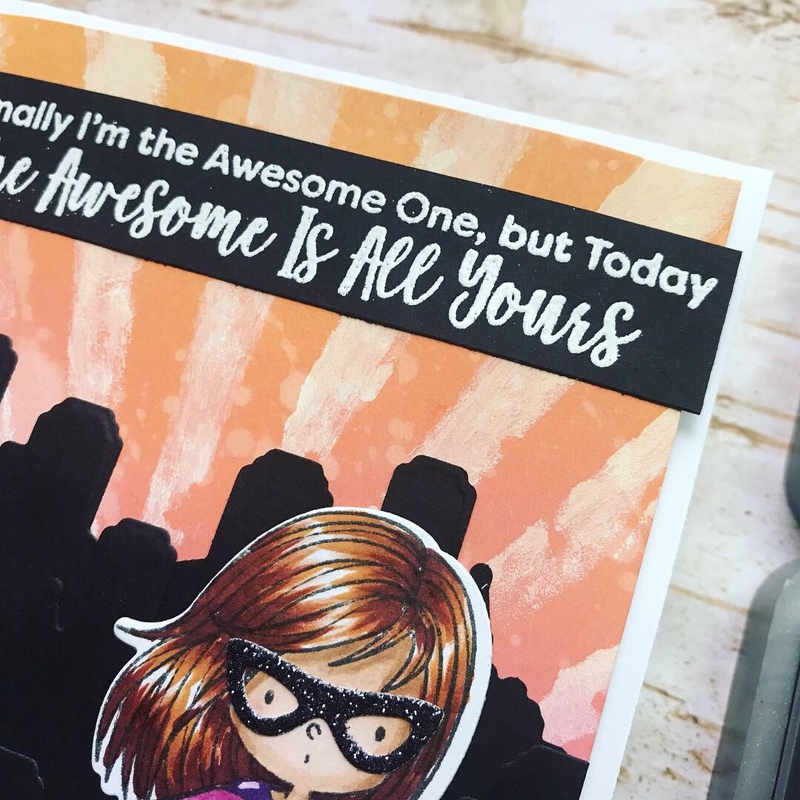 I used a strip of black card stock and my Mini MISTI to heat emboss the sentiment from Sassy Pants Birthday Greetings. I laughed out loud when I read this one, so I knew I had to use it. I thought it went really well with the super hero theme, too! 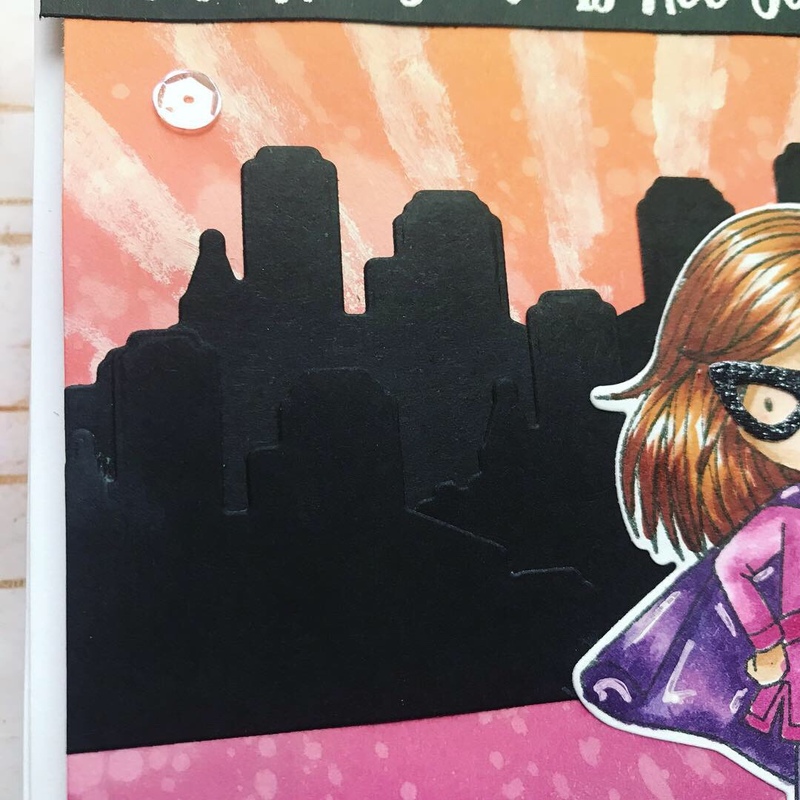 I popped the whole background up on foam tape, adhered my super hero to the front, and shaded the area around her feet with a warm grey Copic marker to help ground her. To finish off the card, I added a few clear sequins. That's it! The card is finished and I don't think I could love it any more.